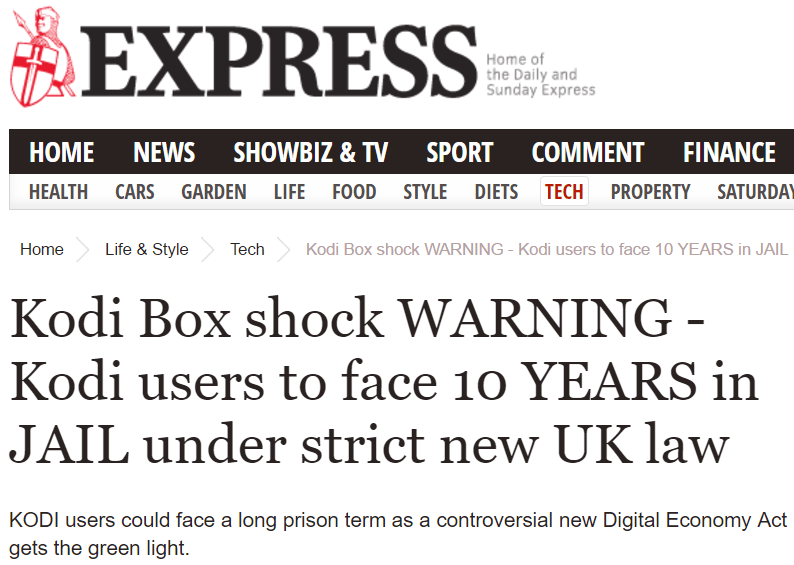 UK tabloids including The Mirror, Daily Mail, The Sun and The Express are reporting that people watching Kodi streams risk ten years in jail. Despite that being a false claim spawned from a click-bait agenda, dozens of other publications sadly followed up by reporting the same 'news'. Today, the Sunday Express upped the stakes by reporting that TorrentFreak readers could be going to prison too. Piracy has always been a reasonably popular topic in the UK and there can barely be a person alive today who hasn’t either engaged in or been exposed to the phenomenon in some way. Just lately, however, things have really entered the mainstream. 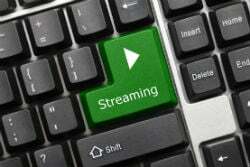 The massive public interest is down to the set-top box craze, which is largely fueled by legal Kodi software augmented with infringing addons that provide free access to premium movies, TV channels and live sports. While this a topic one might expect technology sites to report on, just recently UK tabloids have flooded the market with largely sensational stories about Kodi and piracy in general, which often recycle the same story time and again with SHOCKING click-bait headlines YOU JUST WON’T BELIEVE. We’ve had to put up with misleading headlines and stories for months, so a while ago we made an effort to discuss the issues with tabloid reporters. Needless to say, we didn’t get very far. Most ignored our emails, but even those who responded weren’t prepared to do much. One told us that his publication had decided that articles featuring Kodi were good for traffic while another promised to escalate our comments further up the chain of command. Within days additional articles with similar problems were being published regardless and this week things really boiled over. The above report published in the Daily Express is typical of many doing the rounds at the moment. Taking Kodi as the popular search term, it shoe-horns the topic into areas of copyright law that do not apply to it, and ones certainly not covered by the Digital Economy Act cited in the headline. As reported this week, the Digital Economy Act raises penalties for online copyright infringement offenses from two to ten years, but only in specific circumstances. Users streaming content to their homes via Kodi is absolutely not one of them. To fall foul of the new law a user would need to communicate a copyrighted work to the public. In piracy terms that means ‘uploading’ and people streaming content via Kodi do nothing of the sort. The Digital Economy Act offers no remedy to deal with users streaming content – period – but let’s not allow the facts to get in the way of a click-inducing headline. The Mirror article weaves in comments from Kieron Sharp from the Federation Against Copyright Theft. He notes that the new legislation should be targeted at people making a business out of infringement, which will hopefully be the case. 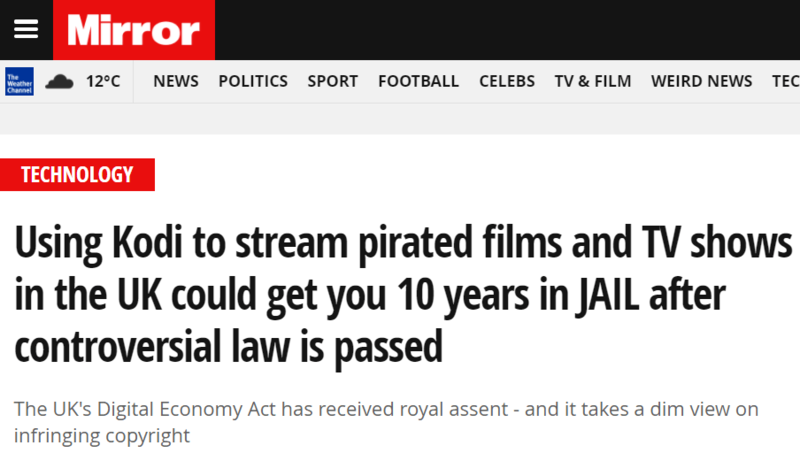 Again, the Digital Economy Act has nothing to do with people streaming movies via Kodi but if we go along with the charade and agree that people who casually stream movies aren’t going to be prosecuted, why claim “10 year jail sentences for Kodi users” in the headline? The bottom line is that there is nothing in the article itself that supports the article’s headline claim that Kodi users could go to jail for ten years. In itself, this is problematic from a reporting standpoint. But singling out the Daily Express and The Mirror on this would be unfair. Dozens of other publications jumped on the same bandwagon, parroting the same misinformation, often with similar click-bait headlines. For people dealing with these issues every day, the ins-and-outs of piracy alongside developing copyright law can be easier to grasp, so it’s perhaps a little unfair to expect general reporters to understand every detail of what can be extremely complex issues. Mistakes get made by everyone, that’s human nature. But really, is there any excuse for headlines like this one published by the Sunday Express this morning? According to the piece, readers of TorrentFreak are also at risk of spending ten years in prison. You couldn’t make this damaging nonsense up. Actually, apparently you can. In addition to a lack of research, the problem here is the prevalence of click-bait headlines driving traffic and the inability of the underlying articles to live up to the hype. If we can moderate the headlines and report within them, the rest should simply fall into place. Ditch the NEEDLESS capital letters and stick to the facts. Society in 2017 needs those more than ever. Update: Claims that TorrentFreak readers could be locked up for 10 years have been removed from the Sunday Express.